The hit Broadway musical "Saturday Night Fever" has debuted on Royal Caribbean's Liberty of the Seas and is the first Broadway show featured on a Royal Caribbean cruise in Europe. Performed in Liberty of the Seas' state-of-the-art, 1,320-seat Platinum Theatre, the musical depicts Tony, the ambitious Brooklyn teen who spends his Saturday nights disco dancing. Tony is played by the British actor Lucas Rush. The addition of Saturday Night Fever to Liberty of the Seas marks Royal Caribbean's third full-length Broadway musical to be performed on its ships. The two other plays are “Hairspray” performed on Royal Caribbean’s Oasis of the Seas and “Chicago” playing on Allure of the Seas. Royal Caribbean announced John Targaglia's Off-Broadway family musical "ImaginOcean" will debut on Freedom of the Seas starting in May 2011. ImaginOcean will be the fourth Royal Caribbean ship to perform the show, joining Oasis, Allure and Liberty of the Seas. Tartaglia was excited to bring his show to another Royal Caribbean ship, "ImaginOcean made its debut on Oasis of the Seas where it ran for several months prior to opening at New World Stages in New York in the spring of 2010. Our goal as the producers of this show continues to focus on making this universal family musical accessible to as many people as possible -- on land and at sea -- and we are thrilled to continue our relationship with Royal Caribbean and install our fourth production on Freedom of the Seas next month." Royal Caribbean International is slipping-on its boogie shoes this spring and debuting Saturday Night Fever: The Musical, the third licensed main-stage musical production at sea for the cruise line. Created by Royal Caribbean Productions in association with Robert Stigwood Organisation Ltd., the acclaimed-West End show will debut aboard Liberty of the Seas in April 2011, as part of the ship’s revitalization and shipboard enhancements beginning in late January 2011 aboard the popular Freedom-class cruise ship. Based on the hugely popular, 1970s feature film, Saturday Night Fever, the theatrical experience features a repertoire of hit songs from The Bee Gees song album sure to inspire guests to dance the night away. 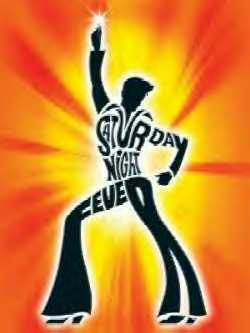 Auditions for the Royal Caribbean’s production of Saturday Night Fever, will be held Oct. 20-22 in New York. More details and a full schedule can be found at www.RoyalCaribbeanProductions.com. In addition to Saturday Night Fever, Liberty of the Seas, along with Freedom of the Seas, will introduce some top-rated onboard features that debuted aboard Oasis of the Seas when the ships are revitalized during scheduled drydocks in January and March 2011, respectively. Many of the onboard enhancements will deliver some of the most exciting entertainment options at sea, such as the DreamWorks Experience, 3D movie technology in the main theater; an oversized outdoor video screens on the main pool deck to entertain guests and offer movies under the stars. Guests also will enjoy new onboard amenities such as iPod docks in every stateroom; the Wayfinder system, with its interactive touch-screen to direct guests, offer venue and restaurant descriptions, and the day’s schedule of programs; guest services kiosks on the Royal Promenade where guests can instantly view, print or e-mail their SeaPass folio or their personal calendar, or check-in and print airline boarding passes; and the popular Royal Babies and Tots Nursery, which provides nursery care for babies and tots through 36 months. Guests also will delight in the enchanting Cupcake Cupboard and the trendy décor of Vintages with its Enomatic wine serving system. The very successful debut of the Oasis of the Seas also came with some new amenities and entertainment options that were never seen on the Royal Caribbean fleet and now Royal Caribbean is set to copy some of those new innovations to existing ships. Starting in early 2011, passengers will soon enjoy new dining opportunities, entertainment, children’s programming and other enhancements on select Royal Caribbean ships already in service. These vessels include Freedom of the Seas and Liberty of the Seas. Today we have the honor of talking to DJ Big Phyll, a Celebrity DJ for Royal Caribbean, who has recently been DJ'ing on Oasis of the Seas. Big Phyll talks to us about his thoughts on where to have a great time on Oasis of the Seas, as well as sharing his favorite aspects of Royal Caribbean's newest ship. 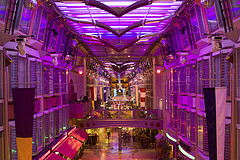 Tell us about what your role is and has been on a Royal Caribbean cruise ship? I am a Celebrity DJ for Royal Caribbean & Scratch Events. I'm the headlining DJ for the featured parties aboard the cruises, as well as guest DJ appearances in the nightclubs. I'll also play some sets on the Boardwalk, Promenade, & other areas. I also teach DJ courses to teenagers on the cruises. Of the places you DJ onboard the ship, what is the busiest/most popular time for dancers? The most popular time is between midnight-3am. There are so many activities, shows, great restaurants, & casinos on the ships, guests are well occupied until late night. But they seem to enjoy finishing their nights at one of the featured parties, or the nightclub, having cocktails with other guests & dancing. The nightclub stays open past 4am, and most nights it's crowded until the music ends. You DJ'ed on Oasis of the Seas recently. Talk to us about the dance and music venues you either worked at or saw. Which ones stood out to you as great places to have some fun dancing or enjoying music? The Oasis is an amazing ship, and it's wonderful that music is a major entertainment piece onboard. There are great venues aboard for dancing, including Blaze Nightclub, The Royal Promenade during the 70's Party, Dazzles Nightclub during the 80's Flashback Party. My favorite venue for parties is the Solarium. Dancing under the Caribbean sky at night is an amazing feeling! Two of the featured parties is on the Solarium deck, and there is always a great turnout. The hot tubs & pools are open, so cruisers can choose to take a dip, dance, and relax. What story sticks out in your mind as the most memorable from being a DJ on a cruise? There isn't any single event that sticks out in my mind because being on the Oasis for a month is a story in itself! The most memorable aspects for me were the interactions with such a diverse group of people. The staff was amazing! They are genuinely nice people who will do whatever it takes to make their guests happy. Interacting with the guests was wonderful. I dined at the specialty restaurants nightly, usually alone, but I always seemed to have a dining companion. Whether it was a sushi chef at Izumi, or a couple at the next table at Giovanni's, conversations were easy to strike up & enjoy. When I would DJ for the guests, they danced & had fun, and were very appreciative of Royal Caribbean bringing me aboard to DJ for them. They would thank me verbally, & with drinks sent to my booth! Any suggestions for cruisers looking to have a great time onboard their ship if they enjoy music and dancing? Be ready to have fun! The dance parties are high-energy, and you'll find yourself dancing hours on end without realizing it...so wear comfortable shoes! Favorite restaurant on Oasis of the Seas: 3-way tie between Giovanni's Table, Chops Grille, & Izumi. I also love Vintages, which I enjoyed tapas & wine flights daily. Preferred drinks on a cruise ship: Tiger's Blood - equal parts Courvoisier & port wine (introduced to me by a bartender at Blaze Nightclub); Italian wines; Louis XIII de Remy Martin. Favorite port of call to visit: Nassau, Bahamas. Favorite track of the moment that you love to play when you're working: "Shots" by LMFAO. 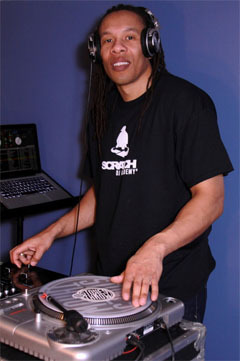 Be sure to check out DJ Big Phyll's podcast "Mixes for Music Lovers" and be sure to add him as a friend on Facebook. Royal Caribbean offered a glimpse into the entertainment options about the still under construction Allure of the Seas. Jeremy Plummer, Director & Choreographer for Blue Planet, took us through this exciting original production. This show has scenes that are unreal! Highlights will be when a tree comes to life as a “living tree,” as well as an enormous mountain scenic unit with trampolines built into it, so you can just imagine the action and choreography that will take place! This show is a departure from any production show we have done, and takes us from the rain forest, to the desert, to the ocean, and then the mountains and brings together the music, aerial artistry and gymnastics together in a very surreal way. This will be a new ice show that brings the board game Monopoly to life. Things like rolling the dice and visiting various landmarks are displayed but "with a twist". we might land on Boardwalk, or Dazzles, or even go directly to Jail. This is definitely a very clever story line. Based on the hit 3D Dreamworks film of the same name, this 20-30 minute show is a family friendly show that is expected to be a great spectacle. While you typically wouldn’t find me using the word “magical,” for obvious reasons, it is truly the word that describes how we will bring to life the movie in this ice show. Our Co-Producer, Willy Bietak, said he has done projects for decades and this was one of his favorites ever.